Add the cooled onions to the bowl of milk and bread. Add the rest of the meatball ingredients—eggs, ground pork, ground beef, salt, nutmeg, allspice, pepper. Using your (clean) hands, mix well for about 2 minutes until the ingredients are well combined. 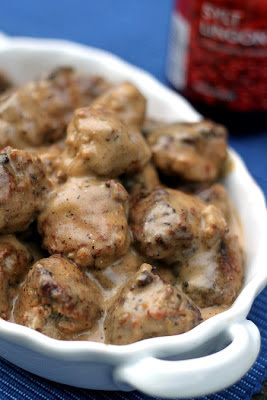 Use a tablespoon to measure out the meat for the meatballs. As you form the meatballs, set each one aside on a sheet pan or plate. You should get 40 to 50 meatballs. Heat 6 tablespoons of butter for the sauce in a large sauté pan over medium heat. When the butter has melted, reduce the heat to medium and add some of the meatballs. Do not crowd the pan. Work in batches, browning them slowly on all sides. Be gentle when you turn them so they don’t break apart. Do not cook the meatballs all the way through, only brown them at this stage. Once browned, use a slotted spoon to remove them from the pan, setting them aside so you can make the sauce with the remaining pan butter. To finish, remove the meatballs from the sauce. Add the sour cream and mix well. Either add the lingonberry jelly to the sauce or serve it on the side if you like. Add the meatballs to the sauce and turn the heat down to low. Cover the pot and cook on low heat for 15 minutes. Remove to serving dish and serve immediately.